Should Karnataka divert the Mahadayi's water to end the water crisis in its three districts? An eerie silence greets visitors to Yamanur village of Dharwad district in North Karnataka. A group of old men are huddled together at a chaupal and slightly ahead, in a by-lane, old women sit together, weeping. In July, a massive police crackdown took place in this village of 580 households in Navalgund taluka. 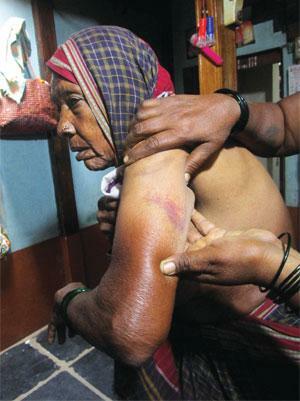 Old women and men, pregnant women and young children were brutally beaten up. Many women were verbally abused and physically harmed. “I was hit with the laathi on body parts I cannot show,” says Kashava Nagappa Chulki, a 55-year-old woman. “I locked the main door of my house as I was with my grandsons—aged six and five—but the policemen pushed it open and started hitting me with their boots and laathis. My grandsons are still in shock and cannot sleep in the night,” Chulki adds. Like Chulki, many others from her taluka, who have been demanding water for the past one year, faced laathis on July 28 and 29. “There is no water for irrigation. The monsoon has played truant for the last three years, and this summer we faced the worst ever drought,” complains Aasif Yalegar, president of the panchayat samiti of Yamanur, where 80 per cent residents are farmers. The protest—against a water deficit which has existed for four decades—took a violent turn on July 27 when an order failed to provide relief to residents. The interim order was delivered by the Mahadayi Water Disputes Tribunal which was set up by the Centre in 2010 to decide the sharing of the Mahadayi river’s water among three riparian states , Karnataka, Goa and Maharashtra. The order, a copy of which is with Down To Earth, sparked violent protests across parts of North Karnataka because it rejected the Karnataka government’s plea to divert 7.56 thousand million cubic feet (TMC) of the Mahadayi’s water to the Malaprabha river, to meet irrigation and drinking water needs of three districts of North Karnataka—Dharwad, Belagavi (forme rly known as Belgaum) and Gadag. The worst affected was Navalgund taluka where farmers, activists and public attacked government offices and set them on fire. Two youth tried committing suicide. Of the 187 people who were arrested for non-bailable offences and released in August, 24 were from Yamanur. 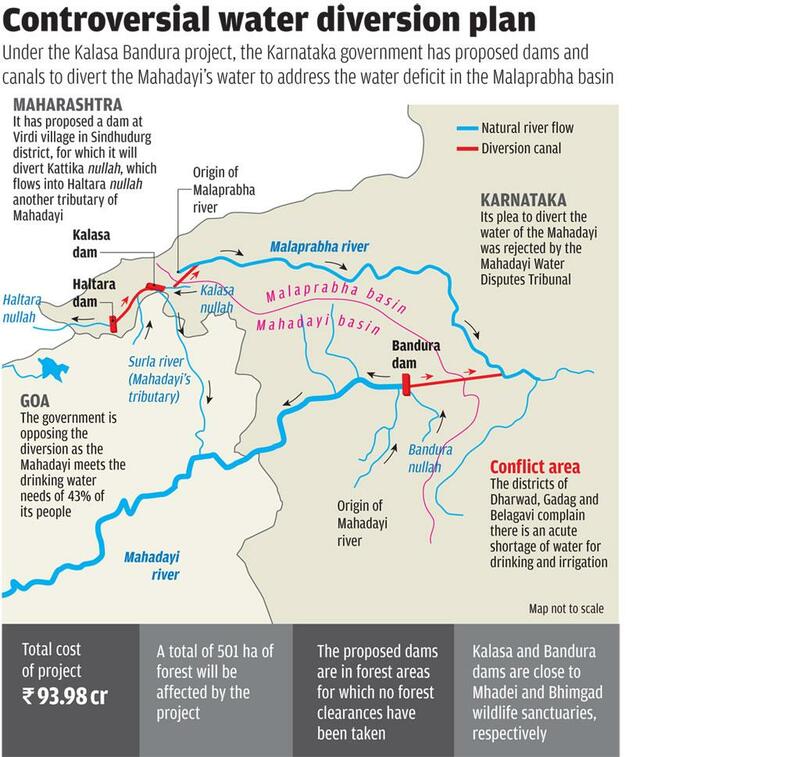 The Karnataka government’s plea to divert water from the Mahadayi basin to the water-scarce Malaprabha basin is based on the recommendation of a committee set by the state in 1980 to address the deficit (see ‘Long-sought diversion’,). The committee suggested diverting four tributaries of the Mahadayi—Kalasa nullah, Bandura nullah, Haltara nullah and Surla nullah—by constructing dams and canals and transferring their water to Malaprabha basin (see ‘Controversial water diversion plan’). This is called the Kalasa Bandura project. Maharashtra, too, plans to divert another tributary of the Mahadayi, Kattika nullah. It has proposed a dam at Virdi village in Dodamarg taluka of Sindhudurg district. But unlike Maharashtra, the government of Karnataka is vociferous about its demand to divert the Mahadayi’s water. And many feel that it is overriding the recommendation and has not considered the feasibility of the project and also its impact on the unique biodiversity of the Western Ghats. But first what caused the deficit. North Karnataka consists of mostly semiarid plateau, and covers 12 districts. It is drained by the river Krishna and its tributaries, such as Malaprabha, which originates in the Western Ghats at Kankumbi (Belagavi district). According to a report which studied data from June 2001 to May 2004, unsustainable land use practices have made the Malaprabha basin the most deficit sub- basin in the Krishna basin. The 2008 report, ‘Hydrology and Water Allocation in Malaprabha’, was prepared by the Norwegian Institute for Water Research. The deficit is being exacerbated by the cultivation of water-intensive crops like sugarcane and horticulture, over the traditional millets and pulses, says Prakash Bhat, Chief Executive Officer of Dharwad-based Society for Community Participation and Empowerment (SCOPE). For instance, in 2011-12, sugarcane plantations in Belagavi and Dharwad—spread over 181,470 hectares (ha)—required 160 TMC water, six times the total yield of the Malaprabha project, according to the interim order. Apart from irrigation demands, unchecked industrialisation has also put pressure on the Malaprabha basin. In the recent past, five sugar mills have been set up in the basin. Also, the Pepsico unit in Dharwad is daily supplied 0.4 million litres of Malaprabha’s water, enough to meet the domestic water needs of at least 16,000 people, states the affidavit of the Goa government. The plea of the Karnataka government has invited the ire of the government of Goa, environmental activists and also the tribunal on many issues. Goa is strongly opposing any move to divert the waters of the Mahadayi, known as Mandovi in the state, because it meets the drinking water needs of over 43 per cent of Goa, says Rajendra Kerkar, secretary of Mhadei Bachao Abhiyan, a coalition of Goan environmentalists who are fighting to protect the river. Mahadayi’s basin spreads over 4 per cent in Maharashtra, 18 per cent in Karnataka and 78 per cent in Goa. Another issue with the diversion is the assumption that the excess river water which flows into the sea is wasted and hence can be utilised to meet drinking water needs. The government of Karnataka reasons that though Goa has 108.72 TMC water in the Mahadayi basin, it uses only 8 per cent. Though this is expected to increase to more than 86 per cent by 2051, it still leaves at least 13 per cent of “excess” water. However, river water that flows into the sea is not a waste as it provides many services. It carries nutrients to the sea, supports fish breeding and also keeps salinity under control. S Vishwanath of Bengaluru-based Biome Environmental Solutions, which works on water sustainability solutions, says that fresh river water can evaporate faster than salty sea water. So if the river water is diverted, it may have a direct bearing on the amount of rainfall in the area. Instead of diverting the water of the Mahadayi, Vishwanath says, the Karnataka government should implement water budgeting—a process to ensure efficient use of water by accounting for the amount of water flowing into and out of the project area, based on available water sources and the annual rainfall. Thereafter, rainwater harvesting structures should be created to augment the local water supply. Vishwanath warns against over-storing rainwater as downstream areas can face water scarcity. Regulating cropping pattern and protecting catchment areas of the rivers are other ways to address the deficit, he adds. After the unfavourable interim order, the Karnataka government has decided to file a special leave petition before the Supreme Cour challenging the interm order. But the residents of Yamanur are yet to get any reprieve and suffer from the apathy of the state government. The government says that under the Krushi Bhagya scheme, over 0.1 million farm ponds were created to address the deficit, but villagers disagree. “In spite of the consecutive droughts, the agriculture department has not done any water and soil conservation work in Yamanur,” complains Raju N Moite, a farmer. There is many a slip between the cup and the lip, and the Karnataka government must not forget it. It only has to look northwards to see how changing cropping patterns, water-guzzling cash crops, unpredictable weather and political apathy have turned Marathwada into India’s new farmers’ suicide capital. North Karnataka may be the next. Thank you for mhadai river dispute information. Am collecting this type of information for compromising this issue.